Parenting is one of the toughest jobs most of us will ever have. As children grow, they face some emotional and physical challenges as they pass various milestones. Parents and caregivers must guide those little bundles through those challenges and discoveries. As a mom of three, I have faced most of the common problems (and some unexpected ones) and more with each of my daughters over the years. The girls have always been avid readers. As a mom, I love books that teach lessons or open the door for parents and families to have some rather series discussions about topics that may be a little difficult for some parents to approach. A new series that I recently discovered is the Can-Do Kids series by Kayla J.W. Marnach. Can these books help you help your children grow? I wanted to share my review of this series with you today. What did I think of the first three books of the Can-Do Kids series by Kayla J.W. Marnach? I received complimentary copies of the three children's books featured here for use in my reviews. All opinions of these books are my own. 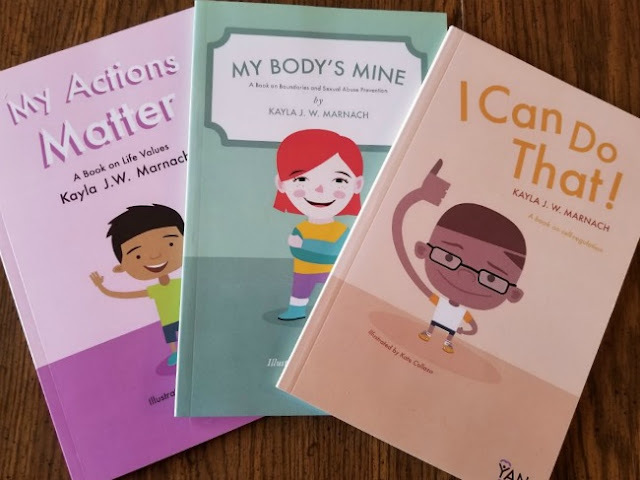 My Body’s Mine was written specifically for children, parents, and professionals with the goal of teaching children self-regulation and body boundaries. Told through rhyme from a child’s point of view, the book helps children and caregivers navigate the sometimes difficult subject of body boundaries and unwanted touching. My Review of My Body's Mine. My Body's Mine is the perfect book to introduce children to a very sensitive subject--in a sensitive way with quick, repeated rhymes and familiar situations that even very young children will understand. This book is an elementary, straightforward book--in both illustration and prose--that helps parents begin to teach a child about personal boundaries and unwanted touching. I would recommend this book for parents or caregivers with very young children--and as a conversation starter with even slightly older children who are ready for more depth to the discussion. I do think that the book should be read as part of a family or educational discussion. I Can Do That! is also told through rhyme to introduce self-regulation techniques and emotion control methods for children. It is an extremely empowering book that aids families and professionals and empowers children to self-manage when they feel themselves becoming dysregulated. My Review of I Can Do That. This little book does offer some great tips and suggestions for helping children learn to control emotions and self-regulate in a short, kid-friendly format. Some of the rhymes are little forced with slightly awkward word choices, and there are a few grammar issues that may make adult readers cringe a bit. If you are parent or caregiver who is likely to get bogged down by grammar and rhymes that flow a little less than perfectly--this book may not be for you. However; having said that, I do think the book has some useful tips to offer parents and caregivers seeking to begin teaching self-regulation and self-control to younger children. My Actions Matter helps children learn life value skills, creating a foundation on how they can connect with others. Told through rhyme from a child’s point of view, this book provides strategies for the child to learn how their actions influence others. The questions at the end of the book provide an easy transition for counselors and parents to open a discussion with the child, to explore ways they can effectively correct their behavior and connect with others. My Review of My Actions Matter. My Actions Matter is a very short book. The author takes a quick look at a few typical behavior issues (attitude, sharing, playing too roughly, etc. ), opens the doors for parents and caregivers to discuss how those issues affect others and she shows the values of behavior do-overs. This book offers its repetitive lesson (which will appeal to young readers/listeners) in the form of a couple of repeated pages after each behavioral concern is addressed. The format and illustrations of those duplicated pages make for slightly difficult reading on the first couple of read-throughs--but, readers will master the flow of the pages the book's end. As with the other books in the series; this book is a great way for parents and caregivers to help children learn about the impact of attitude and behavior on people and animals around them. The book is a quick read--but, should open the door nicely for a broader discussion and it offers some valuable ideas and resources for those with young children. What are My Overall Thoughts on the Can-Do Series? These are basic, simple books using bold colors, rhymes and a simple presentation to help parents discuss some essential topics with young children. Each of the books reviewed here ended with a question and answer section and additional suggestions or activities for parents or caregivers. While I did find some of the rhymes awkwardly formed at times--I did enjoy the resources and tips offered both throughout the books and in the ending sections. I would recommend adding these books to your parenting resource stash to use in conjunction with other resources and family discussions. These books are, again, very basic--but, they offer a starting point for parents just beginning to work with children on the topics addressed. A native Texan, Kayla lives with her husband and three cats in Austin. Her two married daughters, along with her faith, have been an inspiration in many of her writings. She has been a guest speaker at elementary schools, women’s retreats, writer’s groups, and University of Texas. At the request of teachers and counselors, she has provided stories to broach difficult situations. Her passion is to empower and validate children, helping them know they are not alone in their feelings or circumstance, and ways to deal with it. When she is not writing she loves spending time with family and friends, read, scrapbook, and watch old movies.